Topics for questions: Teaching dog trainers, coaching skills with clients, crossover training (switching away from force-based), dog training in general, chicken training, and more. You've been professionally training and working with animals for almost 50 years. What's your first thought when you hear that? You used correction-based tools decades ago before you switched over to more positive training. What was that transition like for you? Many dog trainers suffer from burn-out, or a lack of financial compensation to make it a primary profession. What's been the secret to your longevity in the field? What advice do you have for people who use prong collars, choke chains, squirt bottles, etc. and are considering learning about positive training? Any warnings or good things to look for? Many trainers now have only ever taught dogs with more progressive dog training. What advice do you have for them, especially in terms of talking to people who may currently be using corrections or ecollars? 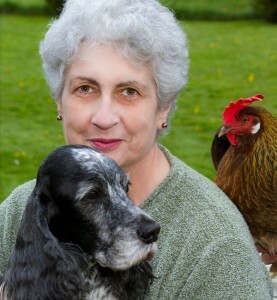 Many of my Animal Pro guests work with a variety of species, but you might be the only one whose press shot features a chicken and a dog, face level on either side of you. What is it about the chicken that helps us learn more about training dogs, or other species? You are a humane trainer and have been a champion of "the human-animal bond" for a long time. Your history with the Delta Society (now Pet Partners) is pretty fascinating and pioneering on so many levels. What do you think has been the biggest breakthrough for animal-assisted therapy becoming more widely accepted? Your book and workshops, "Coaching People to Train Their Dogs," is truly international and you've done a tremendous amount of work in Japan. What are some of the biggest lessons you focus on in your book and workshop? What's the secret to successful classical and operant conditioning? What is, in your opinion, the biggest suitcase of baggage trainers bring to the session that can lead to unsuccessful training? You work with many people just getting started in the field of dog training. When you see a new trainer, what do you look for? What catches your eye and makes you think - "now they've got good training chops!"? You were one of the first trainers to get products into a national pet store chain and you have a very successful line of training aids - I know I've personally had a few of your treat pouches in my career and I have used your sound CDs a lot. Is there a new product in the marketplace that makes you wish you'd thought of it, first? Any new SoundsGood CDs hitting the charts soon? You've helped to establish a lot of training standards within the industry. What's new on the horizon for the industry? and for you, personally that excites you about the future of training? Lastly, you must leave us with your all-time, favorite chicken camp story. Terry has been training dogs and instructing families and dog trainers since 1968. She did undergraduate studies in psychology at Washington State University. Terry and Bill Ryan own and work full time for Legacy Canine Behavior & Training, Inc., a company with international reach that specializes in reward-based dog training methods. For over a decade the Ryans have owned and operated a large dog training center on the Olympic Peninsula in Washington State (USA). She travels worldwide several times a year teaching seminars and workshops. Most popular are her instructor’s workshops and chicken training camps. Terry has been a domestic and international faculty member of the Karen Pryor Academy since 2008, teaching numerous times a year at locations in Washington and Hawaii. Since 1993 she has been conducting chicken training camps nationally and internationally with the intent of helping animal trainers from all disciplines sharpen their skills. Most recently these camps have extended to corporate team building events and continuing education courses for private and public school teachers. She has been teaching an instructor’s course “Coaching People to Train Their Dogs” for sixteen years and wrote a textbook with the same title. The Coaching course involves a unit on chicken training to practice the principles of classical and operant conditioning and how they are applied to dog training. Terry periodically joins forces with TAG Teach International (Teaching with Acoustical Guidance) to conduct combined TAG/chicken training workshops. Terry has a Level 11 TAGteacher certification . Terry Ryan was Program Coordinator for the Dean of the College of Veterinary Medicine, Washington State University, from 1981 until 1994. The programs involved the study of the human-animal bond and implementation of animal-assisted therapy programs. She was one of the original members of the Delta Society (now called Pet Partners) an international resource on the human-animal bond. Terry wrote some of Delta’s early training literature and was one of the first Delta Pet Partners animal evaluators. She presented several times at The International Association of Human-Animal Interaction Organization’s Symposiums. From 1997 to 2002 Terry was a teaching staff member at American Wildlife Foundation in Indiana. This eight-day behavior course for dog trainers used imprinted wolves as the study subjects. Terry Ryan has maintained membership and held various offices in local, national and international organizations including past president and Life Member of the National Association of Dog Obedience Instructors. She is a charter member of the Association of Pet Dog Trainers and was their keynote speaker at the 2007 APDT Conference. She’s trained and exhibited her own dogs in conformation, obedience, tracking and other dog sports. Terry is an American Kennel Club (AKC) obedience trial Judge Emeritus. Terry was one of six chairpersons who wrote the national standards for humane dog training funded by the American Humane Association in 2002 which was later published at Guidelines for Humane Dog Training by the Delta Society. Terry also played a principal role in creating and teaching a national dog training program for the PetsMart chain of pet shops. Terry was appointed to the behavior and training advisory board of the American Humane Society in 2010. Over the years Terry has had long-term contracts to create and instruct national dog training courses in several countries including Australia, through The Animal Welfare League of New South Wales, the Samsung Corporation in South Korea and the Formosan Animal Assistant Activities Association in Taiwan. Terry Ryan has been teaching in Japan since 1990, in the early days spending an average of six to eight weeks per year there. She was asked by the Japanese Animal Hospital Association to develop and teach a national certification program for pet dog class instructors which is on-going today. She consulted on the development of Japan’s first reward-based training center, the Animal Fancier’s Club. In 1991 Terry was asked to design and implement a national Canine Good Citizen (CGC) program for Japan. She developed curriculum and classes as well as the ten-part test currently used today. Terry has arranged for more than twenty five instructors from seven different countries to help her by teaching their dog-related specialty courses in Japan. Terry still teaches on a regular, but not so lengthy basis, working for several different Japanese clubs and organizations. Terry is an award winning author. She writes or has written for several national dog magazines including the American Kennel Club Gazette, Dog Fancy, Off Lead, and Clean Run Agility magazines. She has written over 300 articles on dog training. Her books and booklets include: Puppy Primer, 1990; Leadership Education for Anyone with a Dog, 1992, 2003; Games People Play… To Train Their Dogs, 1995; Life Beyond Block Heeling, 1996; The Toolbox for Remodeling Your Problem Dog, 1998; The Bark Stops Here, 2000; Outwitting Dogs, 2004; Sounds Good CD series, 2006; Textbook for instructors: Coaching People to Train Their Dogs, (also a DVD set) 2005, 2008. The Toolbox for Building a Great Family Dog, 2010. Many of these titles have been translated into Japanese, Spanish and other languages. Previous PostWhat Can I Do If My Neighbor’s Dog is Off Leash?Next PostShould I Stand Up for My Dog? And How?